NOTE: Effective with May billing, Water base rate: $33.00/3,000 gallons (Over 3,000 gallons = $3.50/M) Sewer rate: $28.00. Sewer rate will increase by an addtional $2.50 May 2020. Property owners receive one, convenient postcard billing statement for Water, Sewer and Refuse services. Payment of services are due by the last day of the month. Late payments result in a $5.00 penalty. There is an administrative fee of $2.50 per customer. 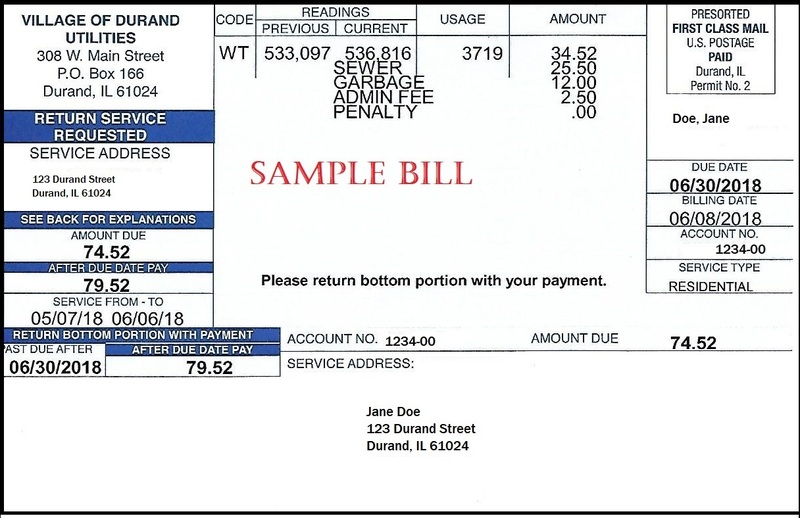 Sewer and waste removal are flat fees, while each property or each unit on multi unit properties operates on a water meter. Water: Water usage is calculated by reading the water meter from the road electronically each month. The monthly cost is figured using the previous month ending reading and the current month ending reading. The water rate is figured as 0-3,000 gallons of water usage=Base Rate $32.00 per unit/apt and anything over 3,000 gallons per unit/apt=$.0035 per gallon. Sewer: Sewer rates are $25.50. 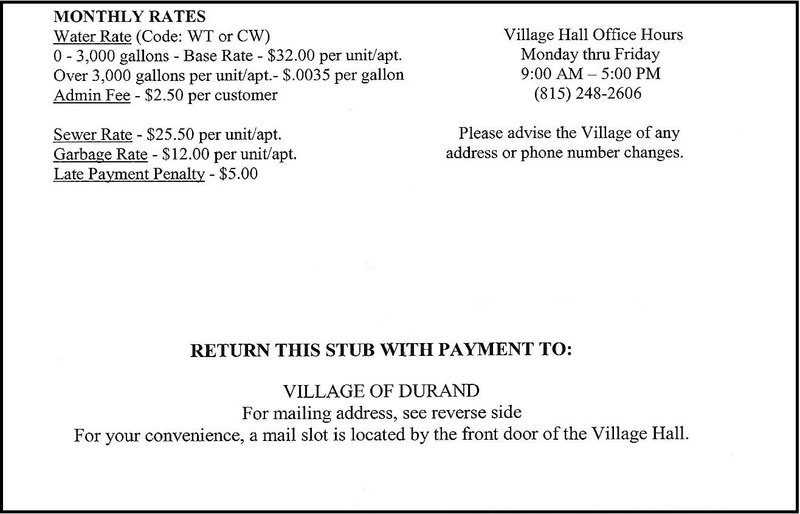 Refuse: The Village of Durand contracts with Advanced Disposal for waste removal within the Village limits and collects payment of $12.00 per unit/apt directly.